With new executive condominiums (ECs) gaining popularity among home buyers, there has been an increase in the number of enquiries on financing for such properties. 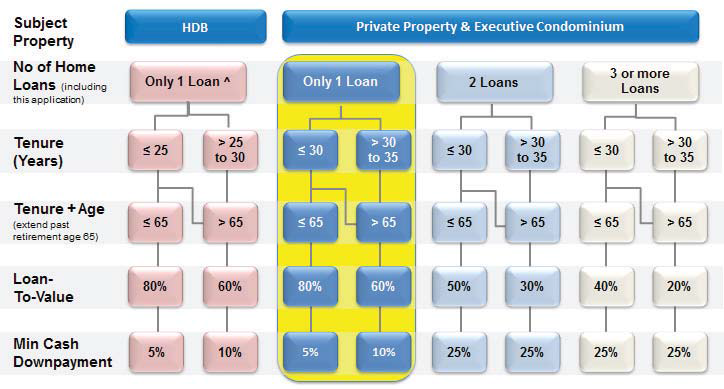 Unlike buying new build-to order (BTO) or resale HDB units in the open market, there is no HDB concessionary loan available for aspiring EC home buyers. Here is a guide for purchasers before they embark on their new EC purchase. The first step for EC home buyers is to assess affordability and home loan eligibility by obtaining an in-principle approval from the banks. Banks will require information on income and debts. This point will be explained in the later part of this article. An EC buyer will pay a 5% booking fee for the option to purchase (OTP), to exercise the sale and purchase agreement (HDB approval takes up to six weeks, before the developer issues the S&P agreement in the following two weeks), and pay the balance of the down payment within nine weeks of the OTP. Upon the payment of the 5% booking fee in exchange for the OTP from the developer, it is highly recommended that buyers apply for a home loan before exercising the S&P agreement. • HDB InfoWeb “Financial information” printout. Once the loan is approved, a letter of offer will be sent to the borrower. A lawyer from the bank’s panel of law firms will be appointed to act for the borrower and the bank. A home buyer who plans to use the cash from the sale of his HDB flat to pay for the new property can consider the use of a bridging loan (BL) when applying for an EC loan. This will effectively help him tide over any short-term financial needs. The bridging loan amount will be the difference between the purchase price or valuation of the new property, whichever is lower, and the applied home loan amount. The lawyer who acts for the EC buyer will advise on the unfinanced portion and the minimum cash component, as well as on the use of CPF. At the end of nine weeks from the OTP, when legal checks are completed, the lawyer will finalise the mortgage with the borrowers on key documents such as mortgage-in-escrow and deed of assignment. Within two weeks of exercising the S&P agreement at the law firm, the stamp duty will be payable (cash up front, with subsequent reimbursement from CPF if applicable). Upon the booking of their new EC from developers, purchasers can choose to pay via the Normal Progressive Scheme (NPS) or the Deferred Payment Scheme (DPS). For those who choose NPS, the developer will instruct the buyer’s lawyer to have the funds released whenever a certain stage is completed. Monthly instalments will therefore kick in gradually based on loan disbursements by the bank, according to the different stages of the project completion. Under DPS, the purchaser can defer the 80% loan repayment till the project is ready to move in, that is, after having received the Notice of Vacant Possession or Temporary Occupation Permit. For home owners who are still servicing their existing HDB loan, no loan repayment on their new EC purchase is therefore required until TOP is served. Depending on the payment scheme the EC buyer chooses, the lawyer representing the borrower and the bank will release the funds to the developer based on the different stages of completion for those buyers who are on NPS, unless they have chosen DPS for their EC purchase. For EC home buyers, the maximum loan to value ratio is 80% (see Chart 1 for loan-to-value ratio, tenure as well as minimum cash down-payment requirements when taking a bank loan). EC buyers are subject to TDSR and MSR rules (see Chart 2). Banks will assess the buyer’s loan application based on both TDSR and MSR computations. Under the TDSR framework, banks need to review the monthly total debt obligations and gross monthly income. The TDSR computation therefore limits the amount of loan to borrowers, capped at 60% of gross monthly income less outstanding debt obligations. MSR will also apply on ECs purchased directly from the developer, in addition to TDSR computation. The MSR limits the amount one can borrow on the purchase of the new EC, capped at 30% of the gross monthly income. In terms of acceptable gross monthly income, the buyer has to furnish acceptable income documents for gross income computation. Do note that a 30% haircut will be applicable for variable income (the table below illustrates how the purchase price and maximum loan for an EC is derived based on both TDSR and MSR ratios). Aden Pang is head of mortgage alliance at consumer secured lending, OCBC Bank. For further enquiries on EC loan financing, contact OCBC Bank at 6363 3333. This article appeared in the The Edge Property pullout of Issue 738 (July 25, 2016) of The Edge Singapore. Copyright © 2016-2018 ExecutiveCondominiums.com.sg | Executive Condos Singapore. Do not reproduce any information within this website without permission.